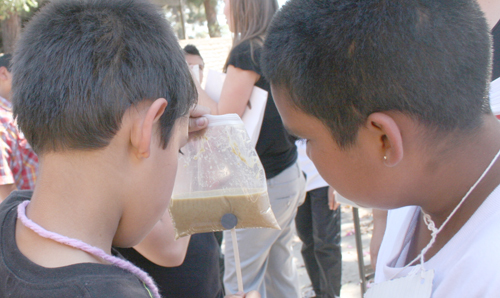 Students of Hamasaki Elementary School observed National Science Day on Sept. 24 by taking part in a variety of fun science activities during a field trip to the UC Cooperative Extension campus, located just around the corner from their school on East Cesar E. Chavez Avenue and Mednik. The hands-on activities explored how pressure builds in the atmosphere and create global warming; what toxic run-off is and how it makes its way to lakes, rivers and the ocean; the uses and benefits of iron in foods, and a trivia contest about fruits and vegetables. Keith Nathaniel, 4-H Youth Development advisor, led the global warming activity using zipper storage bags, water and effervescent tablets. Young people don’t have access to quality educational experiences in science, Nathaniel told EGP, explaining that the 4-H program teaches skills and activities that build on larger concepts. “Fun and learning go hand-in-hand. What you’re teaching goes out the window if its not engaging and fun,” Nathaniel said about activities that encourage kids to literally get their hands into the subject they are learning. His lesson stayed with many students. Sixth grader Alexis Hernandez said she enjoyed seeing how global warming works and was better able to envision how polar caps melt under those conditions. Similarly, Joanna Ruiz, also in 6th grade, said it was fun to see how the effervescent tablet made the plastic bag inflate and noted the lesson that followed the experiment: “… make the world a better place by not polluting,” she said.